It’s surprising the number of seasoned Mac users who serve as the unpaid tech support person for their family and friends’ Macs. These stalwart individuals often need some intimate details about the computer’s hardware and software—details provided by the System Information (Lion) and System Profiler (Snow Leopard and earlier) applications. Automator can make working with these applications quite a bit easier. Our goal is to create an Automator application that, when run from a USB flash drive, will generate a text file that includes specific details about the computer you’re working with—its connected USB devices and installed applications, for example. Further, the application will allow you to choose which details you want in the report—every bit of information that can be generated by System Information (or System Profiler) or just some of those details. Finally, it will allow you to save the report on the flash drive, using a file name of your choosing. It sounds like a lot of work, but it requires just two actions. Here’s how to create it. Launch Automator and in the workflow template that appears, select Application and click Choose. Select the Utilities library in the left pane and then, in the Actions area to the right, select System Profile and drag it into the workflow area. Now select the Text library and drag the New Text File action below the System Profile action in the workflow area. Click the Options button in the System Profile action and enable the Show This Action When The Workflow Runs option. Enable this same option in the New Text File action. In that same New Text File action choose Rich Text from the File Format pop-up menu. (Reports formatted this way are easier on the eyes.) The action’s name will change to New RTF File. Jack a USB flash drive into your Mac that’s formatted as a Mac OS Extended drive. (To format your flash drive, connect it to your Mac, launch Disk Utility in the /Applications/Utilities folder, select the drive in Disk Utility’s volumes area, click the Erase tab, choose Mac OS Extended (Journaled) from the Format pop-up menu, and click the Erase button.) On the flash drive, create a folder called Reports. Drag this folder on top of the Where pop-up menu in the New RTF File action. The Reports folder will become the new destination for the text file generated by this workflow. Choose File -> Save, give your application an intuitive name such as System Report, navigate to the USB flash drive, and save the workflow to your flash drive as an application. You can now take this flash drive to any Mac and run your System Report application. When you do, you’ll be prompted for the information you'd like to include in the report. Just tick off the boxes next to the items you want—Applications, Diagnostics, and AirPort, for example. Click Continue and you’ll see another dialog box that asks you to name your report. This is handy if you need to generate multiple reports for different Macs you service—name one iMac, another MacBook Pro, and yet another Mac mini, for example. Click Continue once again and your report will be saved in the Reports folder on the flash drive. 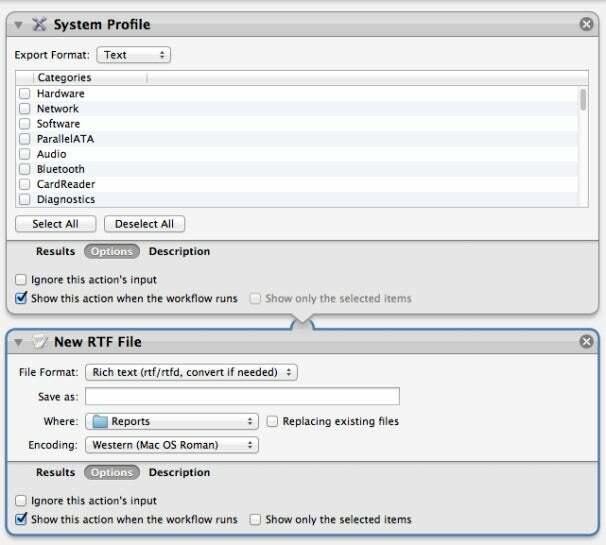 Note that while you can create this workflow with Snow Leopard’s version of Automator and use it with a Mac that’s running Lion, the reverse isn’t true. If you create the workflow in Lion’s version of Automator and attempt to use it with a Mac running Snow Leopard or earlier, you’ll see an error. Also note that the Snow Leopard version of the New Text File action doesn't allow you to choose the output text format—the report will be formatted as plain text.